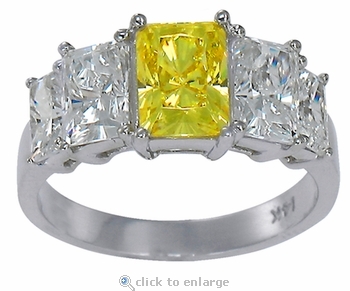 The Emerra 1 Carat Canary Diamond Look Graduated Radiant Emerald Cut Cubic Zirconia Ring is petite yet bold. 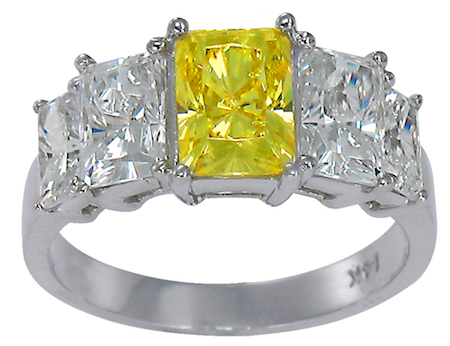 It features a vibrant 1 carat 7x5mm radiant emerald cut yellow canary diamond quality cubic zirconia beautifully centered between two graduating .75 carat each, and two .50 carat each radiant emerald cut stones. Each radiant emerald cut cubic zirconia stone is individually set in a four prong basket style setting in a descending pattern and features 104 sparkling facets that are hand cut and hand polished to exact diamond specifications. The shank on this ring measures approximately 3.25mm at its widest point and includes 3.5 carats in total carat weight. This ring is shown here in 14k white gold but it an also be special ordered in 14k yellow gold, 18k gold or Platinum.